Abacus instrument is a calculating device which makes number representation convenient even for numbers as long as 9 digits (including the positive and negative numbers too). The rods in the instrument represent a digit’s place constituting of beads which are assigned a value each. The beads are moved across the rods for performing operations like addition, subtraction, multiplication and division etc. as per the requirement of the question. This position of the beads is then read out to derive an answer to question. Devices like calculators make calculations faster but never develop skills for numerical representation in children. 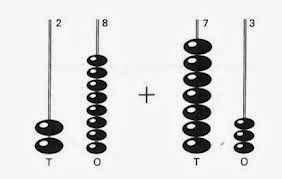 Abacus on the other hand enhances numerical representation, along with amplified linguistic representation indirectly due to effects of concentration, listening skills, memory etc. Abacus course is a “must take” educational program for today’s generation to become competent and have an edge over others. Master Mind Abacus is the best education provider which augments the students’ mental arithmetic skills and makes them confident. Interesting Post! Mental math course helps in brain development of your kid. This abacus course is undoubtedly a very well planned and designed one for maximum benefit to the kids who enroll for our abacus classes.